We present an approach to modeling potential climate-driven changes in habitat for tree and bird species in the eastern United States. First, we took an empirical-statistical modeling approach, using randomForest, with species abundance data from national inventories combined with soil, climate, and landscape variables, to build abundance-based habitat models for 134 tree and 147 bird species. We produced lists of species for which suitable habitat tends to increase, decrease, or stay the same for any region. Independent assessments of trends of large trees versus seedlings across the eastern U.S. show that 37 of 40 species in common under both studies are currently trending as modeled. 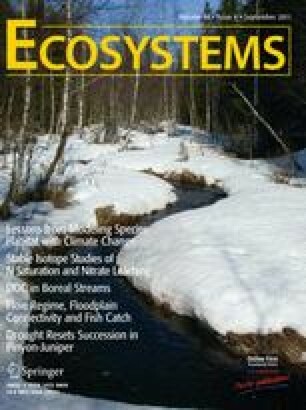 We developed a framework, ModFacs, in which we used the literature to assign default modification factor scores for species characteristics that cannot be readily assessed in such models, including 12 disturbance factors (for example, drought, fire, insect pests), nine biological factors (for example, dispersal, shade tolerance), and assessment scores of novel climates, long-distance extrapolations, and output variability by climate model and emission scenario. We also used a spatially explicit cellular model, SHIFT, to calculate colonization potentials for some species, based on their abundance, historic dispersal distances, and the fragmented nature of the landscape. By combining results from the three efforts, we can create projections of potential climate change impacts over the next 100 years or so. Here we emphasize some of the lessons we have learned over 16 years in hopes that they may help guide future experiments, modeling efforts, and management. All authors performed research over a 16-year period leading to this point; LRI drafted most of this particular manuscript. The authors are grateful to a great number of associates, users, critics, supporters, and reviewers over the years for their help in making this work possible. Funding support has primarily been through the U.S. Forest Service’s Northern Global Change Program. Special thanks to Janet Franklin, Matthew Fitzpatrick, Susan Wright, Susan Stout, and two anonymous reviewers for their reviews. Clark JS, Bell DM, Hersh MH, Nichols L. 2011. Climate change vulnerability of forest biodiversity: climate and resource tracking of demographic rates. Global Change Biol. doi: 10.1111/j.1365-2486.2010.02380.x. Hargrove WW, Potter KM, Koch FH. 2010. The ForeCASTS project: Forecasts of climate-associated shifts in tree species. Eastern Forest Environmental Threat Assessment Center. USDA Forest Service. http://www.geobabble.org/~hnw/global/treeranges2/climate_change/index.html. Matthews SN, Iverson LR, Prasad AM, Peters MP. 2011. Potential habitat changes of 147 North American bird species to redistribution of vegetation and climate following predicted climate change. Ecography. doi: 10.1111/j.1600-0587.2011.06803.x. Matthews SN, Iverson LR, Prasad AM, Peters MP. 2007. A climate change atlas for bird species of the eastern United States [database]. Northern Research Station, USDA Forest Service, Delaware, OH. www.fs.fed.us/ne/delaware/atlas. Prasad AM, Iverson LR. 1999. A climate change atlas for 80 forest tree species of the eastern United States [database]. Northeastern Research Station, USDA Forest Service, Delaware, OH. www.fs.fed.us/ne/delaware/atlas. Prasad AM, Iverson LR, Matthews S, Peters M. 2007. A climate change atlas for 134 forest tree species of the eastern United States [database]. Northern Research Station, USDA Forest Service, Delaware, OH. www.nrs.fs.fed.us/atlas/tree.